This will have a light hearted look on Greenkeeping and Golfing Issues related to the links at Dunstanburgh. But it will be informative and hopefully give you an insight into the Greenkeeping Team and the problems we face. It is my intention during the coming season to have an additional team member added for the Summer Months - If any members are interested please contact me directly. The bunkers at Dunstanburgh are always a big talking point and this year has been no different. We have a handful of bunkers that have not hit the mark this year and we know it. 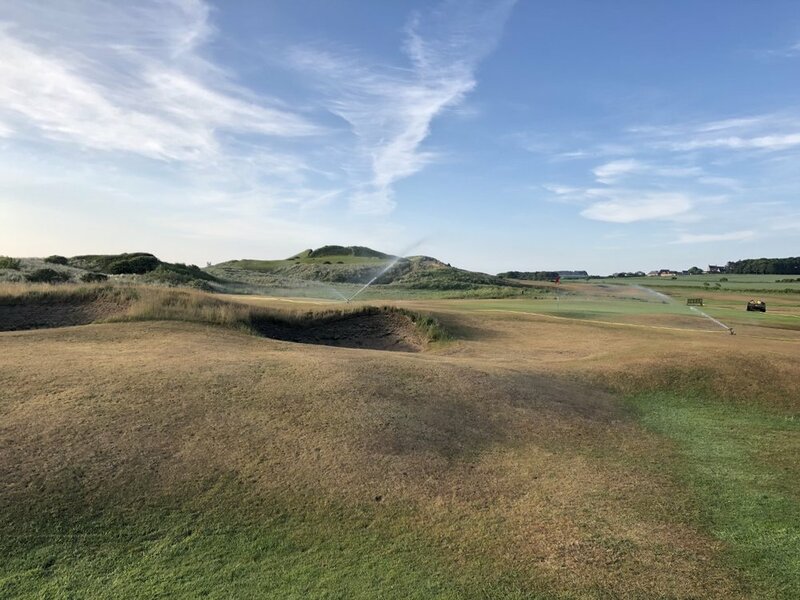 We are working to install drainage and with our recent bunker camp in the last blog post I wrote I explained what we have been up to in improving the Bunker Consistency. Since last time we have installed some news drains into the 10th Greenside bunker and the 2 new fairway bunkers on 14. We are going to be working on shaping the bottoms of the bunkers this winter and replacing the sand for fresh sand which will improve the consistency and play ability throughout the bunkers on the golf course. 10th Bunker Drainage - And an advert for a digger haha! Arrrhhh what we would do for fairway grass coverage now!! Heading into my 11th Season in charge at Dunstanburgh, I have to admit to everyone we have a big task ahead of us all. 2018 was a difficult year mainly due to the weather. The drought from the summer months and the non-existent spring, which followed beast from the east, made things extremely interesting to manage to say the least. Below is a picture of the 17th Approach in May with still 4 Months of summer play to go! 17th Approach .. Islands of Green! I am aware some people will be thinking that not much is happening in the way of recovery but I can assure you the golf course on a whole has come back surprisingly well. However the reality of the situation is we expect very minimal regrowth and recovery between now and the end of March unless there is a heat wave, and we won’t rule that out. Without becoming too technical there is just not enough warmth in the soil together with a lack of sunlight to encourage grass growth through the winter months. We have done major renovations on the fairways this autumn and will continue to do so during the spring (providing we get one) which will improve the fairways and their appearance. On a more positive note our rough management programme has been in full swing over recent months with plenty of cut and collecting. This has been possible mainly due to our newly purchased Terra Rake helping us fine out the bottom of the sward. In the heat of the summer with the lack of moisture the rough has not grown as quickly and aggressively as in previous years which is a major positive for the Golf Course as rough management is something the Greenkeeping team have little control over, due to our Conservation Covenants imposed by the National Trust. We had some weird and wonderful issues with our irrigation system this season. Pictured above is one of the many wireless receivers dotted around the course. 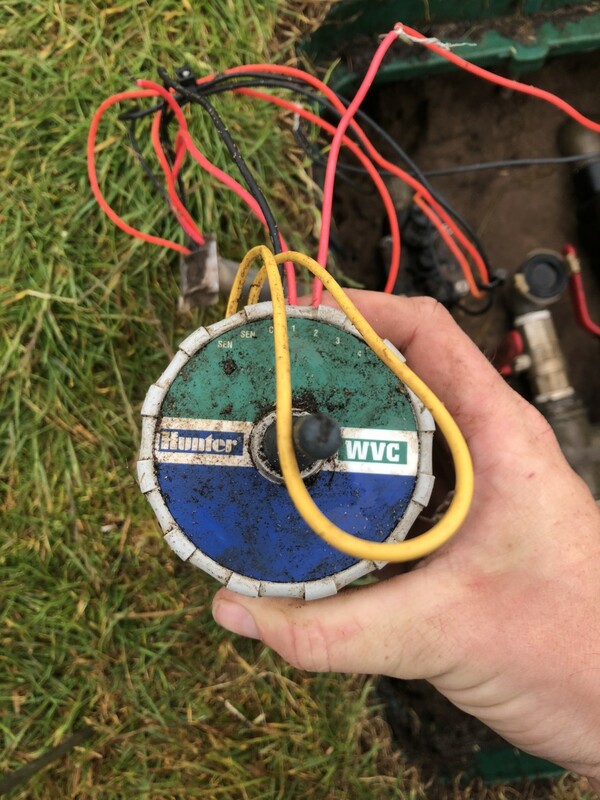 Wiring problems caused by the harsh winter of last year caused early issues to our irrigation on the tees. People may have noticed this in the early part of the season particularly May and June. We also had some solenoid problems which caused isolated dry areas around greens. Once these were sorted we managed to maintain Greens and Tees relatively well and looking at the condition of these now you can see that both Tees and Greens are in a healthy position. Short Course Report generated for the Course Forum. I now conduct a Course Forum which meets every two months and is attended by representatives of the Golf club Members. 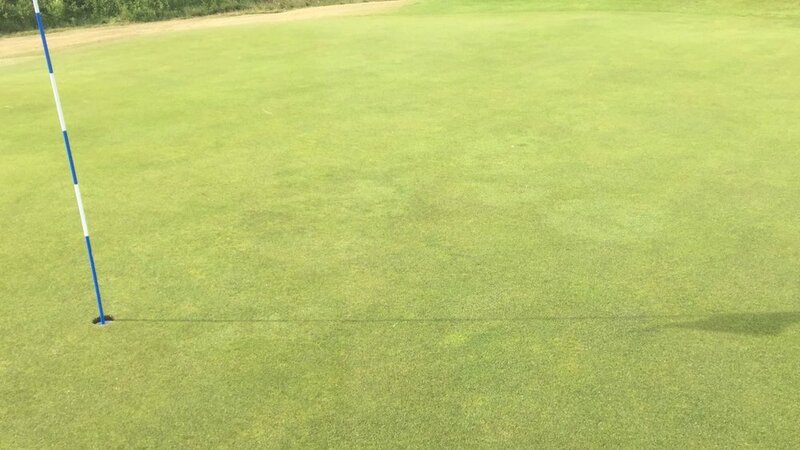 Greens - The condition and consistency on greens has maintained a good standard over the festive period, Greens were not cut much due to the lack of growth and sunlight. More sand will be required on greens to get our desired level of true-ness. Heights will remain at 5mm until any frosts start and they will be increased if necessary. Approaches - The approaches still require some work, especially up on the 4th and round the 7th green but these areas have been hollow cored and over seeded in early October and we are hoping when the weather allows to fertilise these few and we are hoping for more recovery before the spring. Fairways - We are still struggling out on some fairways where germination hasn’t been what we expected. But throughout January major aeration works will be carried out. Also we will be trying to keep buggies to semi rough and certain areas will be roped off. Walkways - A lot of the walkways are extremely worn aeration has been carried out and ropes are now place in high traffic areas to stop more deterioration of these through the winter months. Plans to install sprinklers to certain walk off areas in this winter will go ahead to hopefully allow recovery even in the summer months. Rough - Rough has been better this year, primarily due to weather conditions. The aim of the rough management is to provide rough which will give fair punishment, rather than loss of the ball. I hope you all have enjoyed a small insight to this first edition of the course blog “Reflection of 2018 & January Course Update”. We are hoping to over the next few weeks try and release some shorter blog posts concentrating on certain areas to keep you up to date with the progress out on the links. I hope everyone had a great Christmas, all the very best for the coming year.